From Roman Caesars to Islamic caliphs to Castilian kings, countless empires have called the sun-kissed lands of southern Spain their home. And, as new waves of pioneers would arrive, these peoples and cultures would stretch over each other like layers, until finally, all the layers smoothed together to form a way of life unlike any in the world. Today, you can explore all the rich layers of Spain with a tour on board Al Andalus, a luxury rail experience that promises to show you all gems that this melting pot of kingdoms and cultures has to offer. Stand on the Roman bridges of Ronda and watch the world unfold from atop the city’s magnificent cliffs. Walk the halls of the mosque of Cordoba and behold the splendor of an ancient empire. Savor Spanish culture at flamenco performances and winery tours. All this–and much more–awaits you from the lap of luxury on board Al Andalus. As the official representatives of Al Andalus in the United States, Palace Tours is now excited to offer you a special deal to travel on board this regal train: If you book a six-day, five-night Al Andalus tour departing on Sep. 14, Sep. 21, Sep. 28, or Oct. 19 of 2015, you’ll receive a 10% discount! And while Al Andalus is the most spacious luxury tourism train in the world, it will fill up fast–so book now! For more information on this one-of-a-kind offer or to book your Spanish getaway, visit our website! Full service - Book all your hotels, Paradores, trains, car rental all in one place. 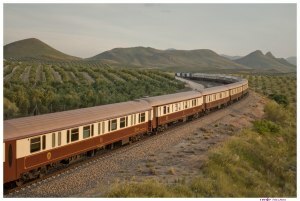 Book your Spanish Luxury Trains early and get reservations at discounted prices. Dynamic Prices are now on which means if you book 6 months or more prior to departure, you not only ensure your reservation, but a great rate for your trip!